According to Sarah Cantrell, office manager and adoption coordinator at the Ross County Humane Society in Chillicothe, Ohio, the Lab-mix puppy was dumped in Yoctangee Park ahead of the Feast of the Flowering Moon Festival, which takes place during Memorial Day weekend. The dog’s owner has been charged with cruelty to animals, abandonment and failure to license. 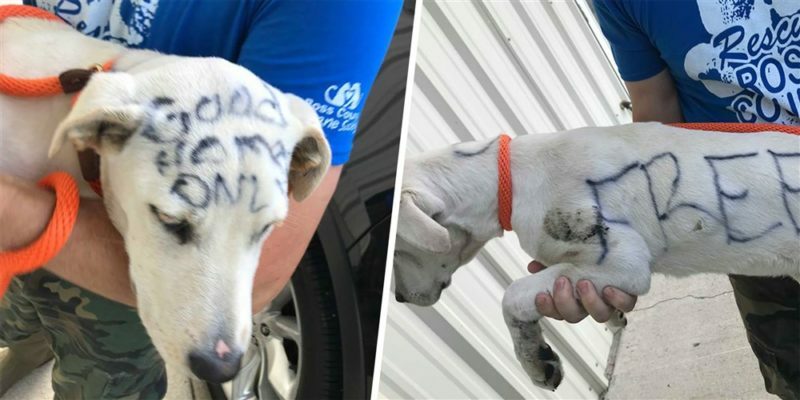 Abandoned puppy labeled ‘free’ in permanent marker finds new home. The Ross County Humane Society takes in approximately 1,200 dogs per year and charges a $50 “surrender fee” to offset its costs in caring for the unwanted animals. Cantrell says the pet owner was told by her landlord that she couldn’t keep the dog. But she stresses there are other avenues to explore if a person cannot keep a dog, including finding a rescue or approaching her organization with the specific situation. “We will work with people,” she said. Thankfully, the dog, who has since been named Marvella (meaning miracle), is faring well. “She’s healthy and sweet and thankfully did not suffer from heat exposure,” said Cantrell. Many dogs that are dumped do not survive or even make it to a shelter. Marvella was given a bath, which removed much of the permanent marker, and spent time enjoying treats and attention from staff.